We are always excited when we come across a program that melds the medium of photography to the Internet, opening up new creative possibilities. It's even better when those programs can create new marketing and sales opportunities for our clients. Whenever this happens we'll be sure to write about it and share our finds with you. 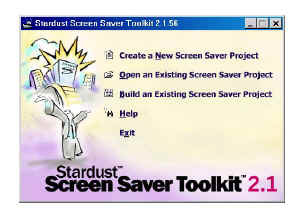 This month we'd like to introduce you to the Stardust Screen Saver Toolkit from StardustSoftware. Screen savers hark back to the old days, when phosphors on monitors could actually burn out if a prompt was left unmoving for extended periods of time. Modern monitors no longer have that problem, and screen savers are now principally used for their aesthetic value. Our research was promoted by request from a web site client, (www.LarryRichardson.com) who wanted to offer his photographic images in a downloadable screen saver from his site. We checked out a range of programs, and were impressed by the power and ease of use of Stardust's offering. 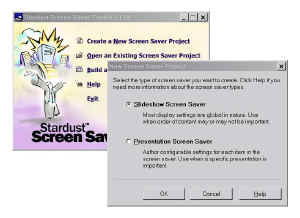 Stardust provides wizards to walk you through each step needed to produce your screen saver. Besides still images, you can also create screen savers using sound, video and animations. Some of its other features are random slide shows, scripted presentations, unlockable "Try & Buy" screen savers, even screen savers that expire. You may also include introduction sequences, transition effects and background music. When you are finished with your design it automatically generates CD, floppy disk, and Internet style setup programs, making it simple for your clients to install your creation on their computer. Our favorite feature is the ability to actually link displayed images to a web site. This is accomplished by using a keyboard shortcut, as touching the mouse will instantly stop the screen saver. Most popular image file formats are supported, but we've found that JPEG's offer the flexibility to let the finished screen saver, if it doesn't contain too many images, fit onto a floppy disk for easy distribution, or download from a web site in seconds. We produced images in Photoshop that had an added text layer containing copyright information, web site URL, and instructions for launching a browser to see visit the clients web site. The benefits of a program like this are wide ranging. Screen savers can be a great promotional tool and can provide you with an inexpensive item to sell. Your presentation can even be a catalogue of images for sale, showing style number and pricing information displayed either above or below the image. We also recommend using it as incentive, or value-add, with purchases. 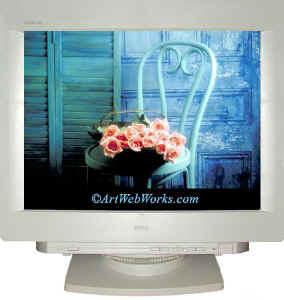 You might even consider creating screen savers with seasonal or holiday themes as gifts. Offering a screen saver to your customers will keep you in their thoughts and your images right in front of them. It offers the opportunity to easily distribute samples of your photography and have them displayed on thousands of monitors. Many of our photographer friends offer limited time screensavers to be downloaded from their web sites requiring payment by their customer for the unlock code. We have even offered free screensavers with a "nag" screen and on receiving a donation provide the code to get rid of the unwanted advertising. 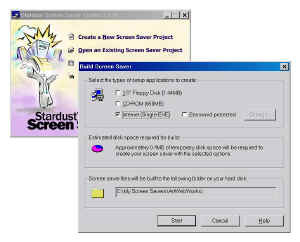 StardustSoftware sells the program for $199 as a download from its web site, or $249 on a CD. You can experiment with their full-featured trial version, which they offer as a free download. Sorry MAC people, it's for PC only. We highly recommend this software, and feel that it's a program that can pay for itself in a very short time. In addition, we have created a few sample screensavers with our own images and have posted them on our web sites for free download. Opening screen of the wizard run Stardust Screen Saver program showing you your choices. It is actually two programs. The first to create the project and the second to convert that project into a screen saver. After choosing to create a new project, you're given a screen that lets you choose what type of screen saver you want to create. 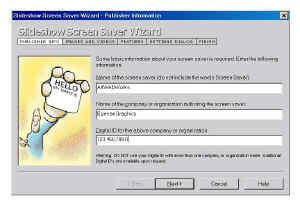 The slideshow screensaver has global settings and the presentation screen saver allows more customization. The next screen allows you to name your screen saver. This is important because during the installation and running of a professional project you want your clients to get their deserved recognition. Insertion of pictures is easy. Checking the preview box allows you to see exactly which pictures are being entered into the screensaver. Each picture can have its own properties. You can specify a name that appears on screen or link it to a web site using the F9 keys. When you've finished creating and saving your screensaver project you then choose to build an existing screensaver project. That's where you can specify whether it will be distributed on a floppy disk or CD, or downloaded from a web site.